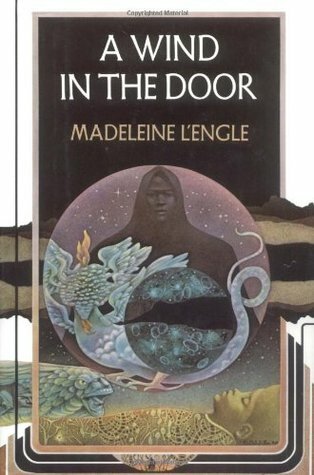 I have to be in a certain mood to read L’Engle’s books about Meg Murry, which is why it took me a while to get to the next one on my list, A Wind in the Door. The story opens with one of the most memorable lines in children’s literature: “There are dragons in the twins’ vegetable garden.” Charles Wallace is indeed seeing strange creatures in the garden, but that’s the least of his troubles. He’s also being bullied at school where the principal, Mr. Jenkins, fails daily to protect him, and he might be suffering from a disease of his mitochondria, which are endangered by something called farandolae. Meg is very worried about Charles Wallace, so when she is approached by a being named Blajeny, who calls himself a Teacher, and assigned to be partners with a cherubim (a singular being so large he is basically plural) named Proginoskes in the completion of three tests, she accepts the challenge and follows her new allies on a quest to save Charles Wallace and many others from being unnamed by the evil Echthroi. I give Madeleine L’Engle a lot of credit for being able to keep all of these strange words, beings, and places straight in her mind, because even trying to summarize her books gets tricky quickly! I was iffy about this one at the start - it’s difficult for a realistic fiction reader like me to settle into worlds where large dragon-looking cherubim appear in gardens! Once I did get my bearings, though, I enjoyed reading of Meg’s high-stakes struggle against evil. The concept of naming someone or something in order to show one’s love for it really appealed to me, as did the separation of acts of love from feelings of love. The concept of kything as a means of silent communication is also interesting, and I like the way it adds this subtle layer of closeness to Meg’s relationship with Calvin. At times, I felt that this book really came close to being too mushy and emotional, but for the most part it walked the line fairly well between too much and just enough. As in A Wrinkle in Time, it’s hard not to consider the religious themes and implications of the story, and I appreciate L’Engle’s willingness to continually take on those big issues. I’m also hugely impressed that she could do so much with a setting - Charles Wallace’s mitochondria - where everything is immersed in darkness and no one moves physically. Everything that happens in the characters’ minds is so interesting and dramatic, and much happens even when it seems like almost nothing is happening. I enjoyed it, too, when L’Engle starts writing in free verse toward the end of the book. I may be a bit more cynical now than I was as a teen, so my reaction was a little bit snide after a while, but I know my fifteen year old self would have related strongly to those sections. I have read A Wind in the Door once before - in library school- and I remembered it as the best book of the Time Quintet. I didn’t have the same reaction this time, but I did like it, and I plan to continue on with my L’Engle reading list until it’s done. Next up is a story featuring Polly O’Keefe, Dragons in the Waters. My own favourite novel in the Time Quintet is A Swiftly Tilting Planet. It "skews" a bit older, though. I did love Mr. Jenkins in this one: he must be the most un-L'Engle character in her entire YA ouevre. Yes, even more so than Zachary!